If you are like my family, you're probably looking for somewhere to go around the 5th November to enjoy some fireworks without paying too much. Now that WP Junior is old enough to appreciate it, I had volunteered to actually buy some fireworks last year but Mrs WP suggested that it would be cheaper (probably thinking 'safer') to go along to one of the many pre-organised events instead. Given our wizened budget the reality was that neither was really feasible. However this year is a whole different story. The budget is still gaunt - in fact even more so after the materialisation of WP Junior #2, but the Hamptons has come to the rescue! 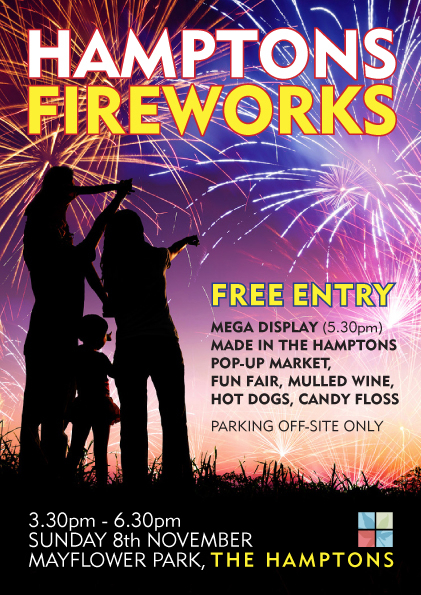 On Sunday the 8th November, hot on the heels of their successful Midsummer Fiesta, the Hamptons are putting on a huge fireworks display for everyone and anyone who wants to come along. WP Junior has just seen the poster and repeated "I want to go. I want to go. I want to go. I want to go." So it looks as if this event is likely to be a big hit - certainly for us!